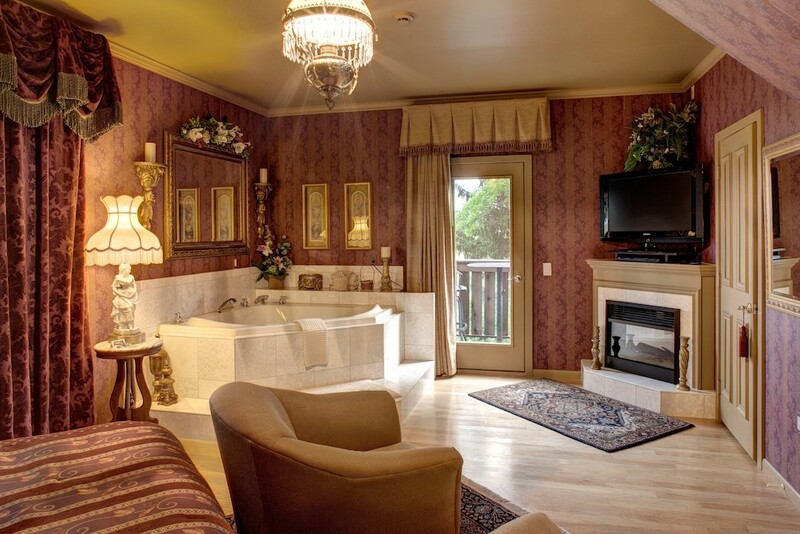 Get whisked away into a different era in this King Suite. 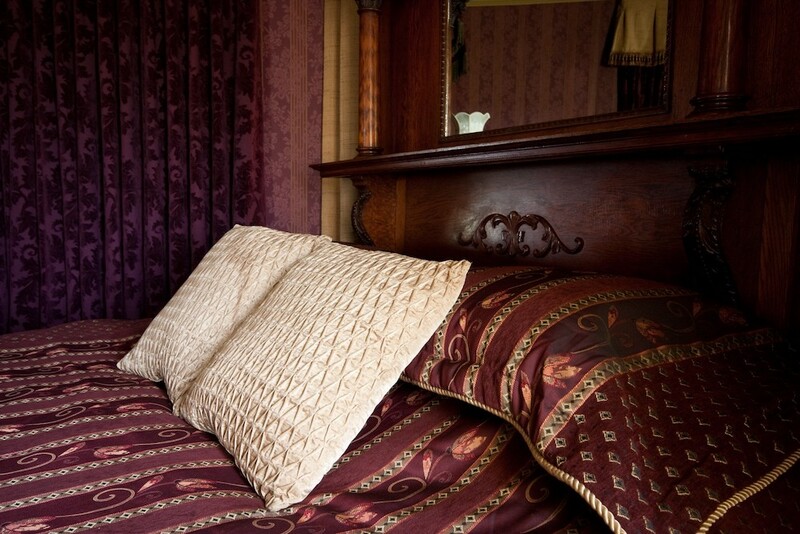 Ribbons of scarlet, rose, and gold cover the walls and bedding in the Victorian. 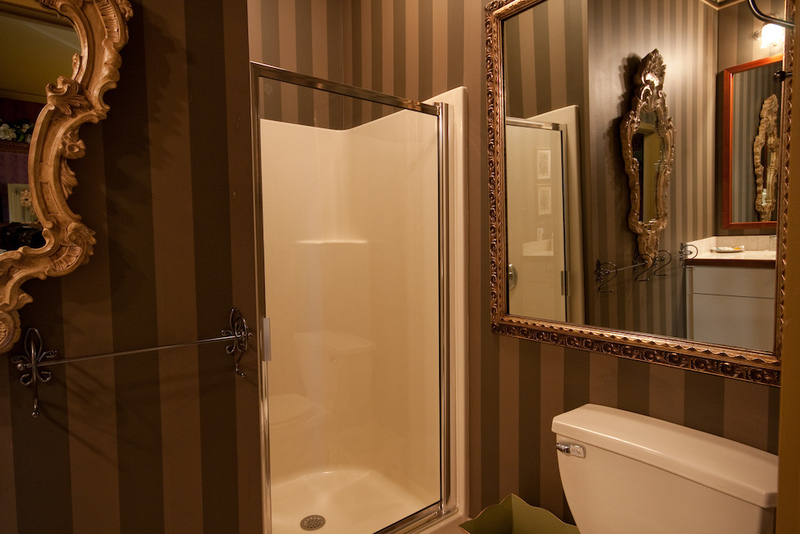 Yards of soft damask velvet with cords of gold fringe hang in curtains around the room. The impressive custom-built headboard is one of the centerpieces of the room. 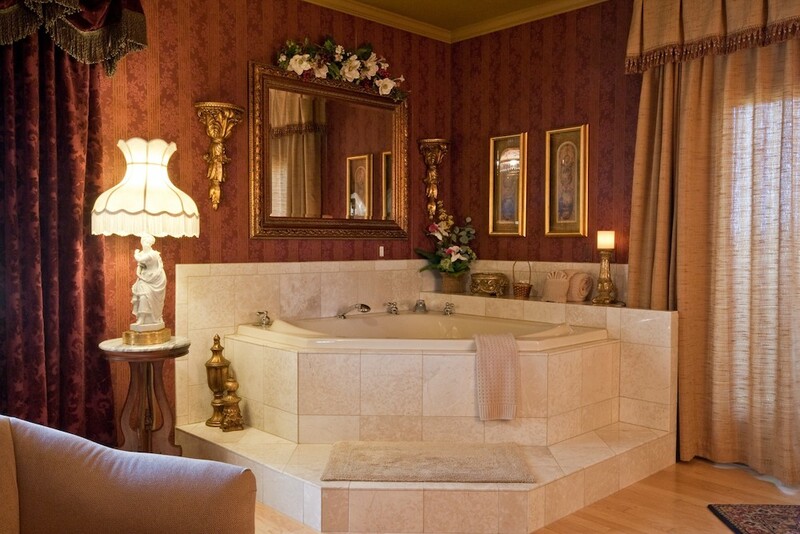 This Suite’s crown jewel is the in-room Jacuzzi tub that sits across from the fireplace. Also unique to this room is the private garden-view balcony which allows guests to see out two sides of the Manor. 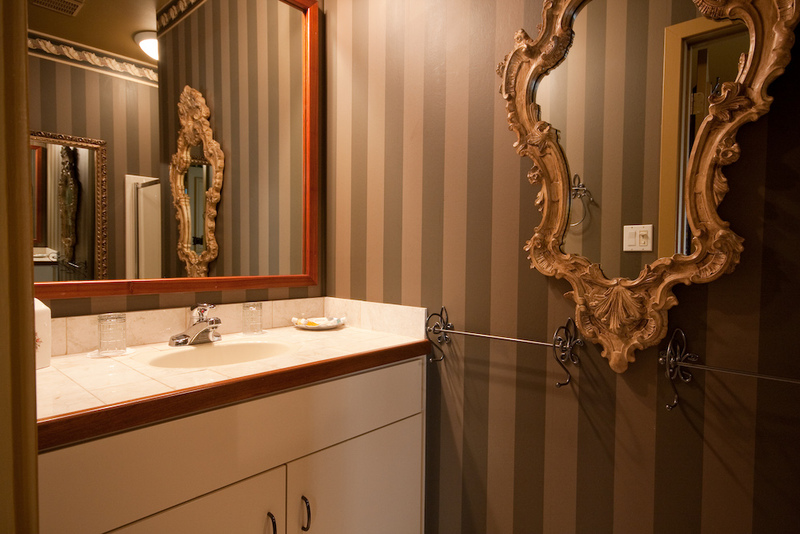 Beautiful grounds, friendly staff, luxurious room & delicious food. Thank you! Thank you, Norm & Staff, this was a wonderful experience! 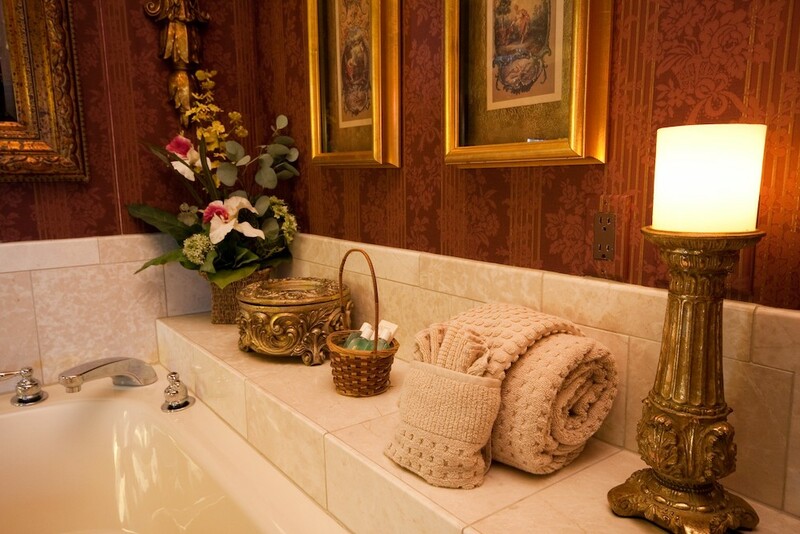 The Jacuzzi, the décor, the atmosphere, the view, EVERYTHING was spectacular. The breakfast was amazing! We will certainly be back and will spread the work about Twin Pine Manor. Again, thank you for having us and for operating in such excellence. Your hospitality & kindness has created an environment established in peace, joy, & relaxation…we wish you much success!! Thank you for an amazing 8th anniversary getaway. Everything was perfect and our room was incredible, romantic, and clean! The bed was extremely comfortable, and breakfast was delicious each morning. This was a last minute find for us and we are so glad it worked out so well. We will be back! My husband and I had the pleasure of staying with you for two nights this past weekend. It was a surprise gift to him for his birthday. The grounds are divine, our room was beautifully exquisite, and the food was phenomenal. Thank you for your hospitality! 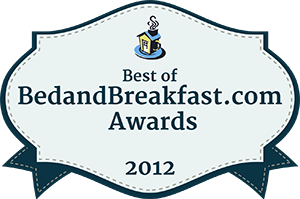 This was by far one of the best bed & breakfast stays EVER! 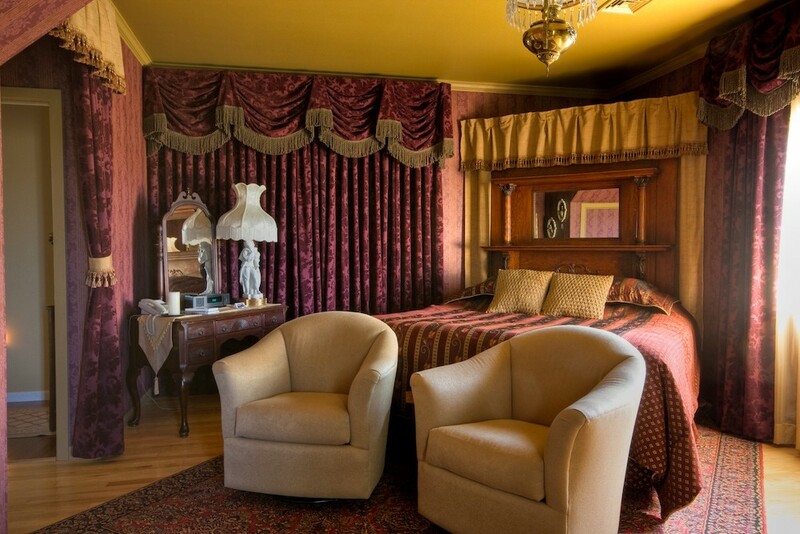 A graceful, Victorian Suite with a king size pillow top bed, in room jacuzzi, private bath and shower, all-seasons fireplace and air conditioning. This is a corner room with picture window and countryside views from your private balcony.